Paradise Lake is situated in Chiang Mai province in Northern Thailand and covers an area of approximately 3.5 acres. The lake is situated a short distance from Chiang Mai city centre and is an ideal venue to fish a short day session for anglers visiting the region. 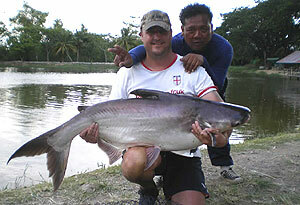 This commercial fishery has variable depths ranging from 0.5-3 metres and is stocked with a large head of Mekong Catfish and .The lake can be described as a ‘runs water’ and regularily produces multiple captures of Striped Catfish and Mekong Catfish with weights between the 10-30kg region. In addition Tilapia, Java Barb and several other barb and snakehead species reside in the murky depths of paradise lake. Paradise Lake in Chiang Mai is suited to anglers of all skill levels and can be described as a moderately easy water to fish. This venue responds well to conventional Thai fishing methods with either bread or cereal groundbait moulded onto feeders and suspended beneath a sliding float. Limited facilities are available onsite in addition to a selection of basic baits, flavourings and end tackle. 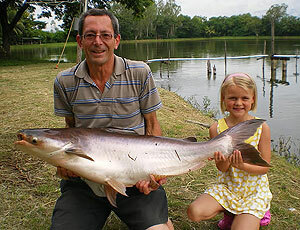 This venue is situated close to Chiang Mai town and as such makes a perfect distraction from the tourist trail for visiting anglers wishing to catch Thai catfish species. With relatively cheap costs compared to some other fishing locations in the Land of Smiles this venue will appeal to both novice and experienced anglers in the region.Thai Food can also be purchased locally and delivered to the lakeside. Visits to paradise lake in Chiang Mai in Northern Thailand can be combined with trips to the nearby Dream Lake complex and can be arranged on a daily basis. In addition this venue can be incorporated into one of our tailor made fishing holidays.